Genius Shirt- Funny "Genius Loading Shirts Look Awesome! Watch out! Only 3% more to load and you are gonna bust some genius on 'em! Our Genius Shirt gives the crowd fair waning that you are about to bust some high octane brainage on them. 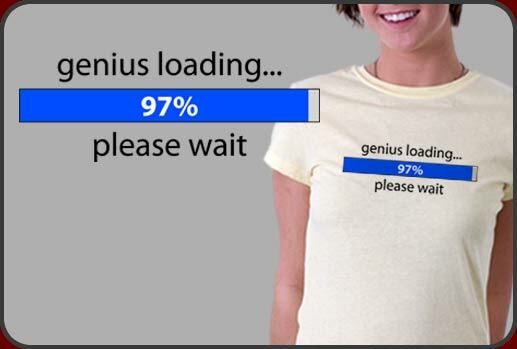 Very funny t-shirt design that features the words "genius loading...please wait" and a loading bar that you are probably familiar with set at 97%. Our Genius Shirt is a hilarious addition to any proud geek's wardrobe. It's fun and easy to wear out to just about any place. Wear your Genius Shirt to work and let those nimble fingers loose on some crafty code! Genius Shirt prints great on all light colors and we have loads to choose from. We have Genius Shirts available for men women and children too with lots of hot styles and colors to choose from. Check out our hot Genius Loading baby doll tees and comfy all cotton mens shirts too.